"William has spent six years running from his past and the last eight months trying to rid his mind of the dreams that increasingly haunt his nights. Maggie had lived her entire life without hope until one man showed her what it meant to be loved. He'd been her light in a lifetime of darkness. Six years ago, that darkness stole him away. Without him, she's surrendered herself to an existence she doesn't know how to escape. In a moment that will change his life forever, William comes face to face with the girl who, with one look, captured his heart. Now William is ready to fight to take back what had been stolen from him six years before. But he never imagined what that fight might cost him." 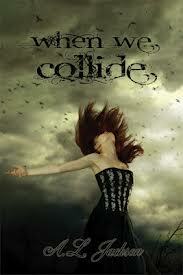 AL Jackson has done it again with When We Collide, this is definitely an emotional roller coaster ride. I cried and laughed throughout this book. Where do I even begin with this review... William, Oh William... He melted my heart with this quote "It was everything that I wanted her to know, that is shouldn't hurt to be touched, that i was ok to be adored." This is a story about first loves that have been torn apart by one tragic event. William may not have made all the right choices but the one thing that he knows, is he is 100% sure about is his love for Maggie. William has never stopped loving Maggie even though he ran from it for 6 years. William loved Maggie from the moment he first seen her, and he felt the need to protect her. I loved how the book was written in both William's and Maggie's point of view. There were times that I didn't agree with the decisions that Maggie made, but when I would read her POV, it made me understand it. It made us understand it a little more what Maggie was going through and how she felt. I cried several times reading Maggie's point of view. I just wanted William to be the night in shining armor and rescue Maggie from that horrible situation. AL Jackson brought awareness to a subject that so many of us no little about, but thousands are effected by it daily. Abuse is a very difficult subject to read about, but AL Jackson has wrote about it and told a great love story at the same time.